But that said, I will also be taking a short blogging break for two or three weeks. One of my best friends is visiting me from Germany, and we have decided to head out into the Rockies for a road trip! I cannot wait... in my opinion there is nowehere as gorgeous as the Rocky Mountains in the summer, and the Jasper-Banff Highway, also called the Icefields Parkway, is simply paradise on earth (well, if you exclude all thr tourists, that is :-)) So after this one, my next post is likely to be at the beginning of August, unless of course I get inspired at a campsite or two or three! 'Biscuit Ambade'... which of course, taste nothing like biscuits, are deep fried and look nothing like biscuits either! Its just one of those random Indian names for food, that Westerners find confusing, like 'plum chutney' that's actually made with dates! So, biscuit ambade are actually gram fritters. They are made with cleaned urad dal (black gram, that's actually white after its cleaned, to add to the confusion!) with some coconut and a few seasonings... and are utterly delicious! 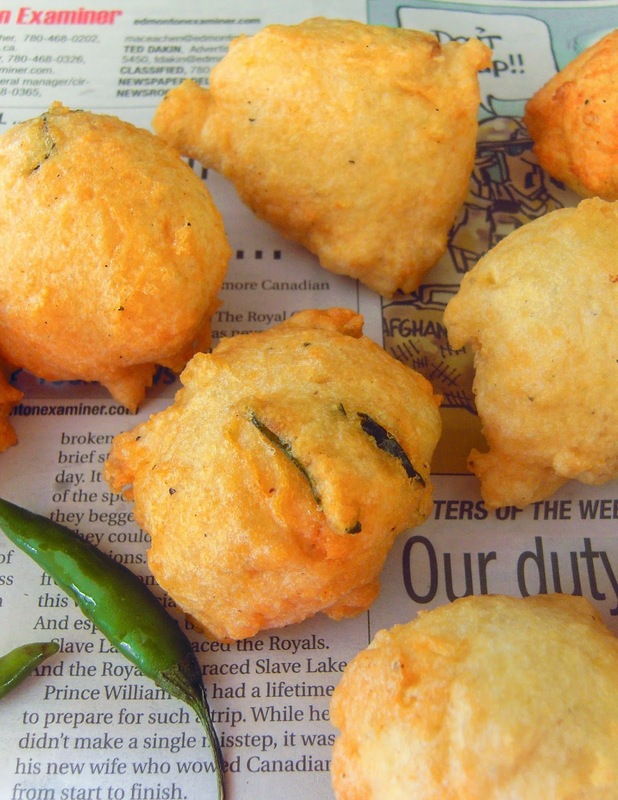 Crispy and golden brown on the outside, and soft and fluffy on the inside, with the hot bite of green chilli, black pepper and ginger and the subtle smokiness of the curry leaves and the delicate, sweet and calming bite of coconut. Another winner from the streets of the Konkan coast. These bring back more memories of being with my grandparents. My Aba would buy these ambades, and bring them back to us, wrapped in newspaper with coconut chutney enclosed in a banana leaf. Invariably, the chutney would leak out onto these ambades, and they would turn into a soggy mess... but what a absolutely tasty mess that was! In fact, when I grew up, and ate ambade that were freshly fried, I kind of missed the taste of those coconutty soggy ones :-) Even today the smell of frying fritters takes me right back to those hot sunny evenings in the village, sitting on the stone verandas, under the swaying coconut palms and greedily gobbling up these goodies, with not a care in the world. Life is sure a beautiful thing, and as I grow older I am realising that its the small things that I've experienced and the little memories that I have preserved that make such a big difference to it in the end! In a blender or grinder, grind the cleaned urad dal with the salt and just enough water to loosen the batter (around 1/2 cup at the most). The batter doesn't have to be super fine, but should be as thick as you can make it. Look at thepicture below to get a sense of the thickness. Mix the chopped chillies, curry leaves, balck pepper and dessicated coconut into the batter, mixing well. Let the batter rest for a few minutes. Taste and adjust the salt. Meanwhile, heat the oil in a deep pan ot pot, until just smoking, hot enough so that a drop of batter rises quickly to the surface covered in bubbles (or until a cube of bread browns evenly in 30 seconds) Turn down the heat to medium. Using a largish spoon, drop big spoonfuls of the batter very carefully into the hot oil. Don't worry if they are not the perfect rounded shapes, they will taste really good either way! Fry for 8 minutes, or until the ambades turn a golden brown colour and are crispy on the outside. Gently lift out of the oil, and drain on kitchen paper. Serve hot with a steaming hot cup of chai, coconut chutney or ketchup! Hi Michelle! Your Gram Fritters look fantastic. And so does your Pork Sarpatel. But your Masala Dal looks SPICY! I love spicy but I do have to be careful. Your photos are so good. Bravo Michelle! Great posts. These look gorgeous. I'm going to have a look out for that cookery book you mention. The fritters look amazing!! Have a wonderful break and enjoy your friend! These look lovely - I could probably only eat 30 or 40 of them at a time, though. Commiserations on the photo fiasco but make sure you have a really great trip. 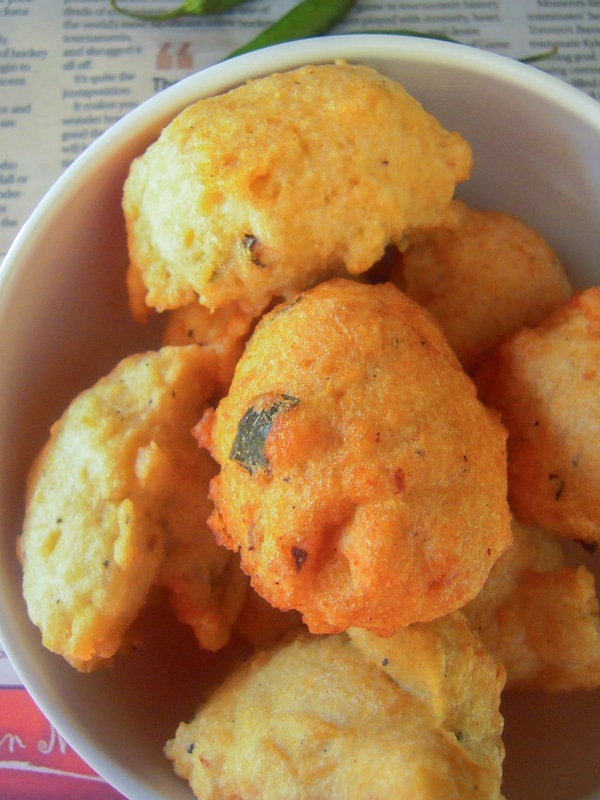 Tempting ambade..We call it vada here at home in mangalore!!! Mom makes it with the hole in between!!! Wow, these look fab. Never really tried proper Indian cooking but my town has two really good Asian grocery stores so I think I will have to pay them a visit. I hope you have MUCH better weather than we had in Banff last week. Our whole trip was rain, cloud and cold except for a few hours during the wedding (fortunately). Most of the campsites were closed! It didn't feel like summer at all. But, that also meant the tourists were at a minimum. The icefields in Jasper are just stunning. The fritters look wonderful - we have something similar in Nigeria called Akara - a sunday morning specialty! Enjoy your time with your friend. Very envious of your trip to the Rockies - I've always wanted to go. Hope you had a fab time. The fritters look and sound delicious and great photos as ever. Johnny, its one and a quarter cup. Yes, just a quarter will be too little.